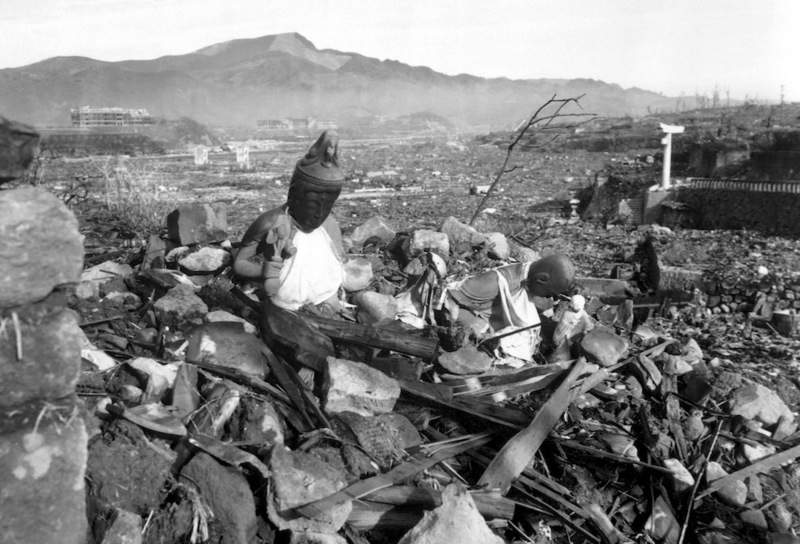 Battered religious figures at a temple destroyed by the U.S. atomic bomb attack on Nagasaki, Japan. Photo courtesy of Cpl. Lynn P. Walker, Jr./Wikimedia Commons. Can you think of a more innocuous word for a machine that could eradicate a city in seconds, incinerating both humans and buildings within a radius of several miles? But in the moments after the blast, J. Robert Oppenheimer—who oversaw the design and construction of the world’s first atomic bomb—was overcome with emotion. From the Trinity explosion onward, the ways that Americans have talked about nuclear war—in policy speeches, Civil Defense campaigns, in media—have been more “Gadget” than “destroyer of worlds.” We’ve adopted and accepted a language that is detached and sterilized from the reality of what a nuclear bomb actually does. We’ve developed a whole nuclear linguistics that allows us to consider “winning” nuclear wars and other impossibilities—as exemplified in President Trump’s statements and tweets about North Korea. It’s long past time to consider whether the way we talk about nuclear bombs makes us more likely to launch one. In the beginning of the nuclear age, this coded language was part of the secrecy of the Bomb itself and then the early Cold War. It was barely four years after the Trinity test, and the subsequent bombings of Hiroshima and Nagasaki, when our erstwhile ally, the Soviet Union, ended the U.S. monopoly on atomic weapons with a flash in the Kazakh plains of Semipalatinsk. Game on! And a game it was. Beginning in the late 1940s, senior intelligence officials, military leaders, and politicians scrambled to understand the practical functions of this fundamentally new and devastating weapon. There was the policy called “containment,” by which communism would be sort of “fenced in” by nuclear threats. Later there was “deterrence,” whereby the pain we would inflict on an adversary if they did something we didn’t like was assurance that they wouldn’t do said thing. Nuclear weapons and war became the fundamental underpinning of international security—based almost entirely on theoretical concepts with no real way to test them. Once nuclear-armed missiles and later nuclear-armed submarines joined the mix, the numbers and types of weapons grew dramatically. The very existence of the planet hung in the balance. There was no defense against nuclear attack. It became urgent that we learned how to manage these deadly arsenals so that they wouldn’t be used. The answers came from policymakers’ belief in game theory—a concept drawn from economics—as well as assumptions about what had worked in the past, and confidence in the rationality of your adversaries. The approaches to avoid the very catastrophe these weapons were built to unleash were described and conveyed in language that often had dark, absurdist undertones. Mutual Assured Destruction, or MAD, is the most famous, and perhaps most honest. The NNSA has an ongoing program to upgrade and prolong the operation of U.S. nuclear weapons. It’s called the “Life Extension Programs.” How’s that for Orwellian doublespeak? Nuclear war is so terrible and awesome that the very thought of it stymies people from doing anything about it. That dynamic was aided by the continuous generation of words and phrases that sanitized and distanced people even further from reality. There were scores if not hundreds of phrases, words, and acronyms used to talk about nuclear bombs exploding (“stockpiles”), and nuclear war unfolding (“ladder of escalation; proportionate response”). OK, enough history. Where are we today? Consider our own National Nuclear Security Administration (NNSA). (Notice the word “security” rather than “weapons”?) The NNSA has an ongoing program to upgrade and prolong the operation of U.S. nuclear weapons. It’s called the “Life Extension Programs.” How’s that for Orwellian doublespeak? The first bomb to get this facelift is a gravity bomb carried on aircraft. Known as the B-61, it is categorized as a “tactical nuclear weapon.” Tactical connotes a limited, battlefield scale utility, right? But this bomb has a “yield” of up to 170 kilotons, roughly 15 times more powerful than the bomb that devastated Hiroshima. No normal person, reading of this in the news, will be able to decode this “tactical life extension” for what it is. President Trump’s imminent “Nuclear Posture Review” is expected to have elements that would support building so-called “mini-nukes.” These are said to be more “usable” in a conflict, and their name gives them a diminutive, friendly air. But the very idea of a usable nuke undermines the entire premise of nuclear deterrence and the special status of nuclear weapons that is supposed to draw a bright line between them and all other weapons. Nuclear weapons are, and should remain, in a class by themselves. But on top of the continued use of “Nukespeak,” we now face another risk: a president who seems to not understand the specialness of nuclear weapons. During a Republican presidential debate in late 2015, he said: “With nuclear, the power, the devastation is very important to me.” Later in the campaign, it was reported that candidate Trump, during a briefing on foreign and defense policy, asked multiple times about “why, if we have nuclear weapons, can’t we use them?” These statements suggest that the president simply doesn’t get how nukes are different—very different. They aren’t supposed to be used. Lest you think that this is just Trump being Trump, the fact is that our current military and national security leaders have been gaming out a military attack on North Korea. The belief is that we can attack them in such a way that they understand it’s just a “bloody nose”—not a full-scale war. What could possibly go wrong? We are living at a dangerous confluence: first, a tradition of language that masks the true nature of nuclear war; second, terms that support the ongoing maintenance of the nuclear establishment; and finally, a president who threatens their use with schoolyard-like taunts that ratchet up the risks of actually doing so. But we needn’t succumb to this Nukespeak. We all have the power to use the same social media platforms as those in positions of power. We have more access to information about nuclear weapons than we ever had during the Cold War. And we have perhaps the most potent leverage of all—an equal stake in the risks of nuclear war. We are ALL, at the end of the day, targets. In many ways, the nuclear age was constructed linguistically. And while we do not yet have the access or policies to dismantle the nuclear bombs ourselves, we do have the ability to dismantle the language that has made them possible. Social media is one place to fight with memes and words. There we can to reveal the lie that turned the “destroyer of worlds,” into “proportionate responses” or “limited” or “surgical” nuclear strikes. And, most of all, we can explain loud and clear that there is no ice pack big enough for a nuclear bloody nose. Paul Carroll is a Senior Advisor at N Square, a funders initiative that seeks to attract innovation and collaboration to reduce and eliminate the threats from nuclear weapons and materials. He has spent more than 25 years in government and non-profit roles as a policy expert supporting such efforts.